Carina is sick and tired of her father; he always restricts her activities with her friends and is very nosy about her personal business. Carina is already very upset and when her dad blames her for something she didn’t do, she just loses it. Carina seeks revenge by leaking a story about her father to the press, and in turn, her father takes away her privileges. Carina loses her iPhone, access to her father’s money, and worst of all- she now has an allowance instead of a credit card. Carina also gets into trouble by volunteering to plan her school dance to earn money. But when Carina finds out that the party manager wants her to do this for free, Carina has to decide- tell the manager about her money problems or go on bluffing and chance messing the party up. Lizzie and Hudson, Carina’s best friends, volunteer to help her but she refuses, saying that she can do this on her own. Will she be able to pull it off? 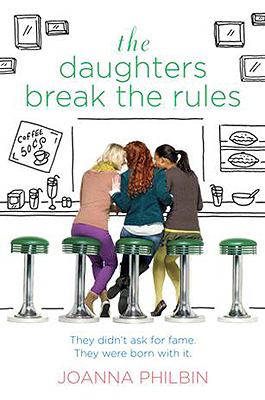 Keep an eye out for my review of the 3rd book in this series, The Daughters take the Stage!